Posted on December 25, 2009 by Alicia Bay Laurel	in Blog. 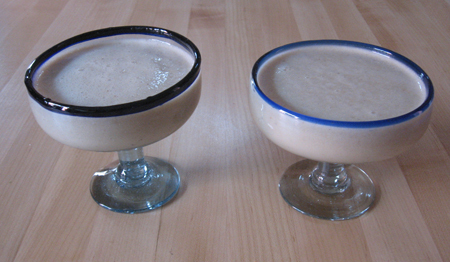 Here’s an eggnog so healthful you can drink it all year long! Place in a blender jar and whir until creamy and smooth. Serve in festive glasses. Note: David Little, the holistic healer who taught me this recipe, liked to add a squirt of Renshenfengwangjiang, a ginseng and royal jelly syrup (“as the booze”). Just want everyone to know that Alicia Bay Laurel’s wonderful vegan eggnog has been a big hit I’ve brought to 2 holiday parties this year, and counting (and in past years too). Per one serving: One banana; one cup almond or some such kind of milk (oat, soy); some agave syrup; and a sprinkle of nutmeg. Basically, combine these ingredients in a blender in proportions that look good, and blend; it’s hard to screw it up, though one time I added a smidge too much nutmeg. Delicious; not too unhealthy; does not make you feel like you might puke, like regular eggnog can. Spike as desired. Thank you, Alicia!!!!!!! It is fabulous! As addictive as real eggnog but no horrible repercussions, like Pam says.